If it’s the second week of December it’s Geminid time! Get an armful of warm blankets, a mat and find a place to lie down where there aren’t any street or other lights to interfere with meteor spotting. Bring a buddy or BFF to help and keep you company because the best time to see the Geminids, a meteor shower that can have 120 meteors racing across the sky, is between 11:30 p.m. Dec. 13 and 2:30 a.m. Dec. 14. 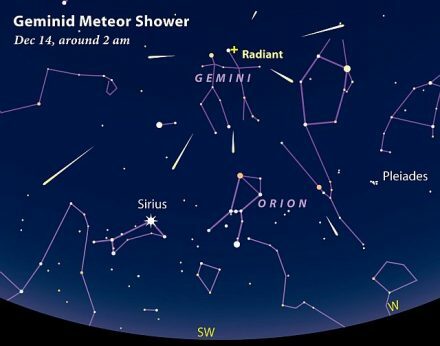 Well actually, the Geminids have already begun but there aren’t as many now as will be seen in a couple of nights. They are named for the Gemini (Twins) Constellation because it seems as if the meteors come from somewhere near the constellation’s star Castor. No telescope is needed. Just hope that the weather cooperates and the sky is clear and look up. It may take a little while, maybe even an hour, to adjust to the night sky before “catching a falling star (translate that as meteor). But be patient. The meteors are out there. Two good sites that have more information are Space and Time and Date.